the same time as the adacent Sherborne House in 1651. In 1750, the first Lord Sherborne, James Lennox Dutton, rebuilt the church, adding a spire and a vaulted roof to the tower. 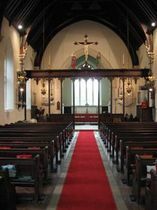 Further changes were made by the second Lord Sherborne between 1820 and 1859, when the gallery and box pews were removed. The pulpit, choir stalls and high wooden screen separating the nave from the chancel were added by lady Sherborne between 1931 and 1934. 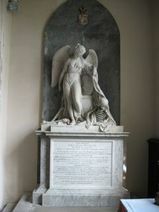 The Dutton family were patrons of St Mary Magdalene's from 1617 to 1961, and there are several monuments to the family in the church. 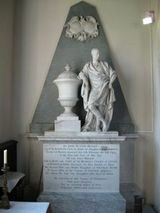 To the left of the altar is a memorial to James Lennox Dutton by Richard Westmacott the Elder, dated 1791. It depicts an angel trampling the hideous figure of death. Opposite this is a sculture of Sir John Dutton in Roman costume. Note the error and correction made by the stonemason! 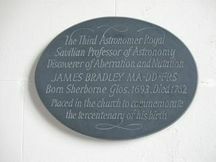 At the back of the church a plaque commemorates the tercentenary of the birth of the astronomer, James Brdley. Bradley, born in Sheroborne in 1693, became one of the country's greatest astronomers, and in 1742 he was appointed as the third Astronomer Royal. With his uncle, the Revd James Pound, he was able to estimate the distance between the sun and the earth as 94 million miles; this was half a century before the actual distance of 93 million miles was calculated. He was also able to calculate the speed of light with remarkable accuracy based on his theory of abberation. 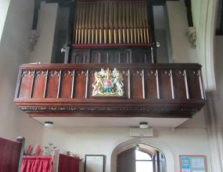 The organ was built by George Maydwell Holdich in 1870. It was originally situalted under the west window, but in the early 1920s, Lady Sherborne had it move to the present organ loft. The organ was restored in 1964 and a new pedal board was fitted. Further restoration was carried out in 1995.